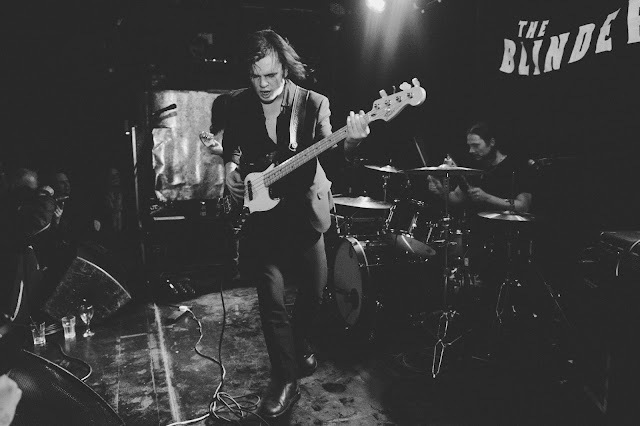 In some interviews The Blinders argue that there is no such thing as originality, everything derives from something else and as much as being different, standing out from their peers and being original seems to be in the band's DNA, they do not accept being given such a tag without questioning it. 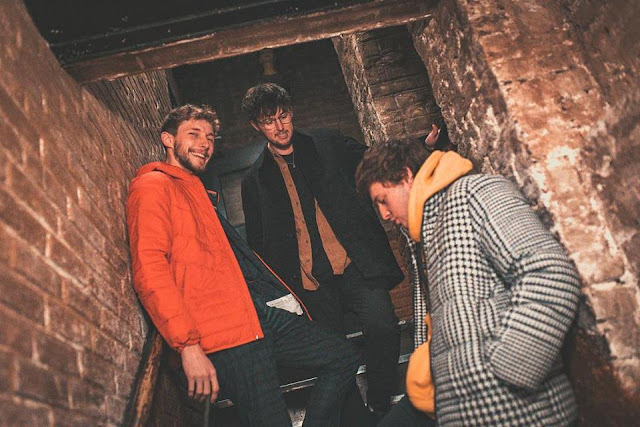 Establishing whether it is modesty on their behalf or simply a case of being super self critical is not easy because when it comes to the Manchester based, alternative rock trio, the two seem to blend in and become close to inseparable. 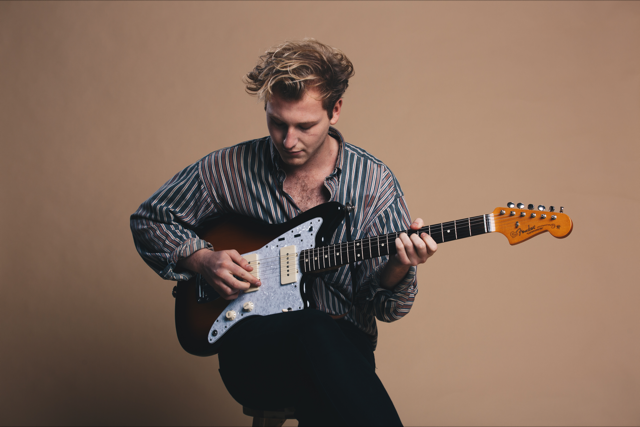 Guitarist and vocalist Thomas Hayward, drummer Matt Neale and bassist Charlie McGough have plenty of confidence in what they do. 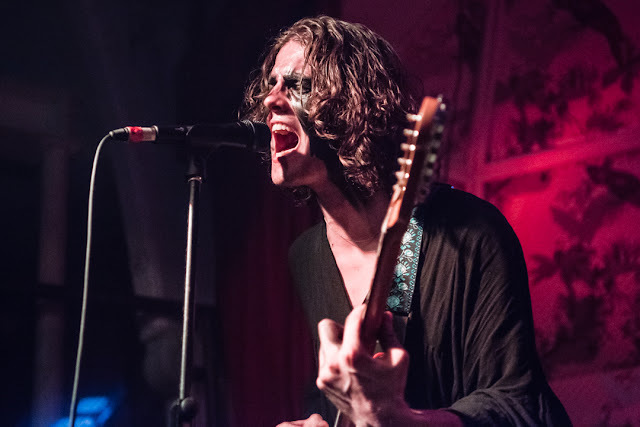 From reading about The Blinders, attending their live shows and from speaking to them, there is this sense that their creative universe is full of stark contrast. In a way it seems to be what drives them and to remain at one end of one spectrum is less attractive or interesting. As a band they have this raw and powerful 'thing' together. There is the knowledge that they are a lot more than a band and what they give people represents something that reaches further and is more significant for that reason. Thomas: You write about what you know and we are very much into other art forms and perhaps that is why we are so different from other bands at the moment because we don’t take influences from conventional places, it is quite unorthodox. Seeing them play live and experience how instinctive, primitive and charismatic they are all points in that same direction. There is a real rawness to their art form, it feels all consuming, leaving you hungry for more. Even after one of their live shows, you are not entirely happy because you want more of the same. Music journalist, broadcaster and musician John Robb has seen the band perform live several times and he is thrilled to see how well they are doing. John: Their intensity allied to their brilliant songs and dark edge and killer sense of dynamics and the way they looked all totally hooked me, it was one of those moments like seeing Nirvana play to 10 people in 1989 when you just KNEW. 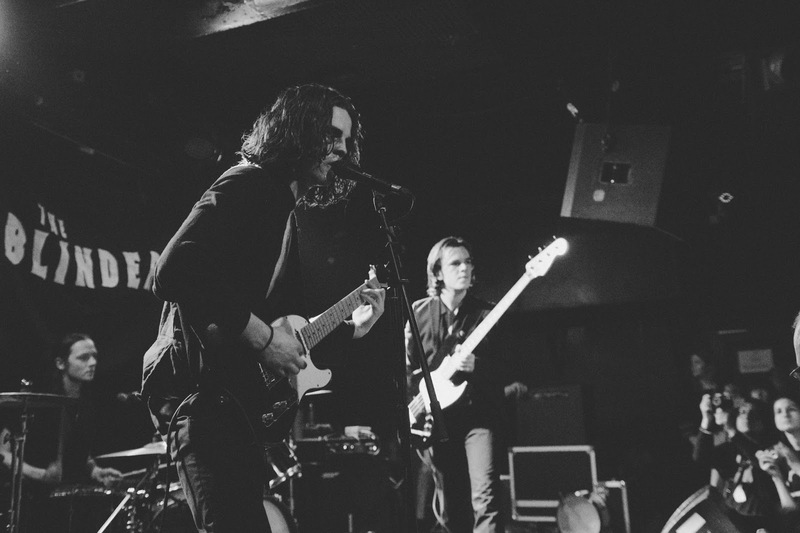 The Blinders are everything you want a rock band to be and, yet at the same time, it almost feels like they are not a rock band, or at least not in a traditional sense. John: There is genuine intensity. A communal mind which sees each corner of a perfect three piece play a key part in the sound. Their genuine swagger is not just rock star posturing. Their dark edged songs, the way the guitar plays off the running bass, the powerful drumming, their sense of image and their corrosive power and the fact they have something to say, there is so much that is great about the band. On the one hand, the trio operates in what it sees as a grim political and social reality where homelessness, the inflict from tuition fee debts, Brexit and Trump rule. In that reality, they promote their own views and awareness in a strong voice. John: There is lots of good bands now and then there is a great band. 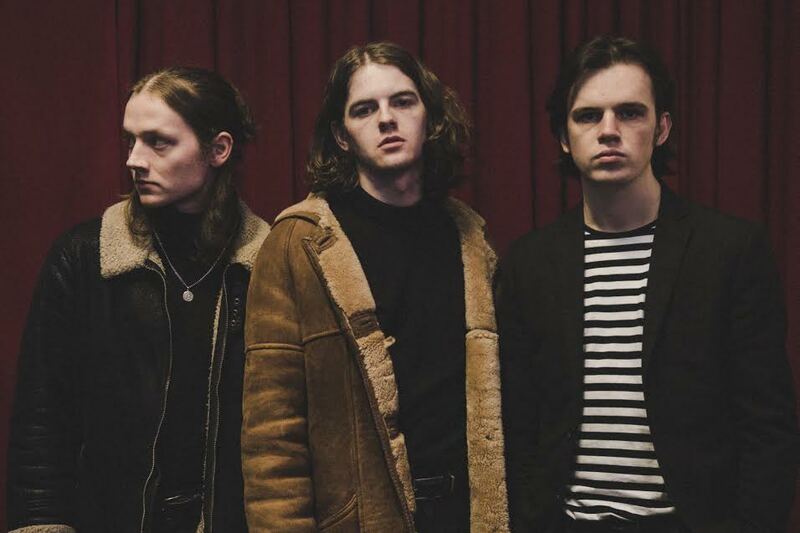 Also despite what people say every generation needs a band to deal with its own personal blues and The Blinders are arriving in the post Brexit landscape to find a generation bemused by its parents and looking for a new narrative to uneasy times. A great band can seize the moment. Having a strong political awareness partly comes down to their backgrounds, being from the city of Doncaster and staying true to the roots and identifying with what they know. Charlie: It is about where we are from, we are from mining villages, it is sort of bred into you, straight away, very early on. We have always had that sort of attitude that we sort of write about what we see and what we care about and that just kind of informs everything such as social situations as much as our political writing. 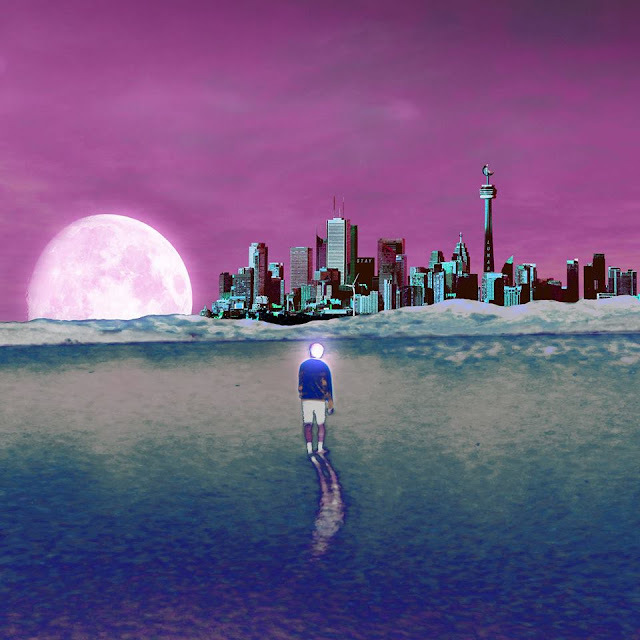 The band also engage with a dreamlike, psychological, subconscious universe that allows them to live out fictional characters, role playing and drawing on influences from theatre and drama. That is a level where the likes of Sigmund Freud and surrealism probably are more important than punk, alternative rock or Jeremy Corbyn for that matter. This inner reality that they project on stage has a connection to the idea of the subconscious and involves bringing (back) to life, iconic historical as much as literary figures. The band continue to refer to a diverse range of figures from the arts, politics and popular culture. It involves the likes of Charles Manson, Jack Kerouac, Christopher Hitchens, George Orwell, Jim Morrison, David Bowie and John Lennon. The 1960s and the 70s also work as strong influences; culturally, technologically as much as artistically. Besides that, they all share a love of Nick Cave, Avalanche Party, Strange Bones, Cabbage and The Arctic Monkeys. 'Johnny Dream' is a fictional character invented by the band, he comes to life when they are on stage and wearing make up is key to bringing him in. Thomas: He was derived from this alter ego we wanted to manifest. It was this way of splitting the off stage personality from the on stage one. The two are kind of slowly bleeding together now, so I should probably stop wearing the make up now. Charlie: I think we tried to get across what we are when playing live but trying to mix it a lot more. There is only so much you can do on stage. We have always been mixing in literature as well as art and we do try to get across as much as we can. Things are going well and following the recent successful completion of their first UK headline tour to critical acclaim with several sold out shows. With a bit of time to breathe the band can look forward to what looks set to become another hugely significant year for them. 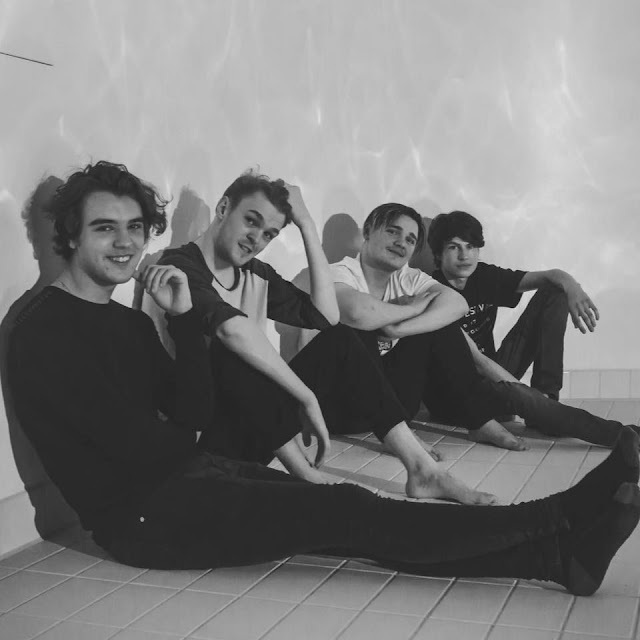 Their excellent new track Gotta Get Through was released on YouTube and Spotify and new material (12 songs) have been recorded and delivered for their eagerly awaited debut album due for release in autumn via their record label Modern Sky UK. With more live shows and festival slots confirmed and in the diary there is more than plenty of scope for anticipation, excitement and further achievements to come their way. They enjoyed working in the studio with producer Gavin Monaghan, 'the wizard of Wolverhampton', at Magic Garden Recording Studio, but also admit to feeling the heat and intensity of being deeply immersed in a project over a prolonged period of time. Luckily the producer, or the 'puppet master', as Matt describes him, brought a lot to the process, from actual know how to being a calming influence when things became a bit intense. Ultimately, as a result, things worked out extremely well. Charlie: The initial idea was to go in and just record material for an EP with four songs but we came out with 16. A full album and we are very happy with it. We hope to get it out on vinyl as well and that is why we shortened it to 12 songs. Thomas: It got very intense mentally and emotionally; doing 12 hour days, you are spending a lot of time with the same people, in the same room. But Gavin really knows how to pull 'this thing' apart and he will drive you for everything you have got. Matt: Even if the album has been done in this slightly dull grim place we got something great out of it. It is a good thing in the long run though at the time it might not have seemed that way. The Blinders got signed to their label Modern Sky UK at end of last year. The impact of having actual financial backing and freedom to do things is immense and being signed to a label that can facilitate and let the band have creative autonomy is ideal. Thomas: Our label is incredible, they allow us to take the reins when it comes to the creative side and we even do our own artwork and our music videos, they almost have no involvement in that sense. I think more labels need to do that because there is a level of raw art that not a lot of bands seem to be able to get to make. Thomas: We just have a different way of doing things and that is probably what comes out but in terms of lyrics. Charlie and I get together and throw ideas, Charlie will come into my room with a stack of papers and he will say this is what I have got and then we will rearrange it. Charlie: I think the only real difference is that we go with the lyrics more, we start with them and we write the music to the lyrics, as opposed to writing lyrics to the music. Thomas: We just sort of tune into sounds, if it sounds good, it feels right then we will do it. Yes OK, something might be a no no in the laws of music, but we will do it. Because the methods that we use are so unorthodox, it is just quite a basic and primitive method but if something just sounds good, then we will go with it. 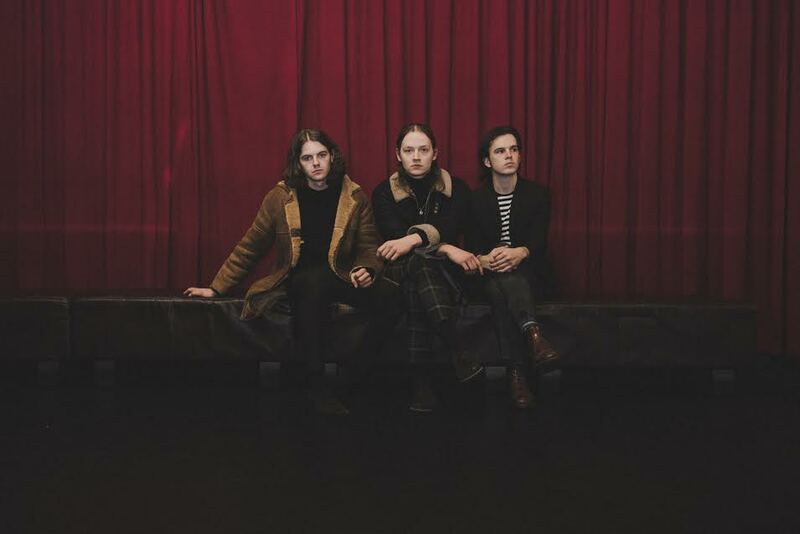 Here is to hoping their wonderfully unorthodox ways of writing lyrics and music along with their theatrical and powerful stage performances will continue to work well for a very long time to come and this is only the beginning to a long in-depth exploration of The Blinders' art form. There is a genuine need for what they create. The city of Manchester provides an ideal platform for them to be creative and develop as artists and the band will probably stay in Manchester for the foreseeable future. It would make a lot of sense to stay. John Robb moved to the city from Blackpool years ago. John: Tony Wilson always called Manchester a city of Immigrants, from the French Huguenots bringing the weaving to the West Indians bringing the style and their music to the Irish bringing the soul to the Italian street musicians in the industrial revolution to young bands from Doncaster. Everyone is welcome like Warrington's Ian Brown, Macclesfield’s Ian Curtis were welcome to the city and became its icons. John: It is what makes the city great, the Manchester music scene is proud that the Blinders choose the city as their springboard it is what makes it the best music scene in the country. Matt: The way things are going is really great. Continued progression is what we are looking for. We don’t want to end up at some stale dead end, we just want this level of progress to continue. Thomas: We are just writing away right now. We make music for ourselves as much as we make it for other people and so we would be very disappointed if we just carried on doing something purely because people like it. I think we are always trying to develop what we do. The Arctic Monkeys are a beautiful example of this as every album sounds completely different but it always retains that sound.